Casino Joy Review - That's Casino Joy not Joy Casino Review! Casino Joy not to be confused with Joy Casino is a newer casino on the block. On first impressions this casino doesn’t disappoint. The theme, look and feel are awesome. The promotions on offer are decent and so is everything else. It doesn’t scream innovative but none the less a safe secure and fun casino. 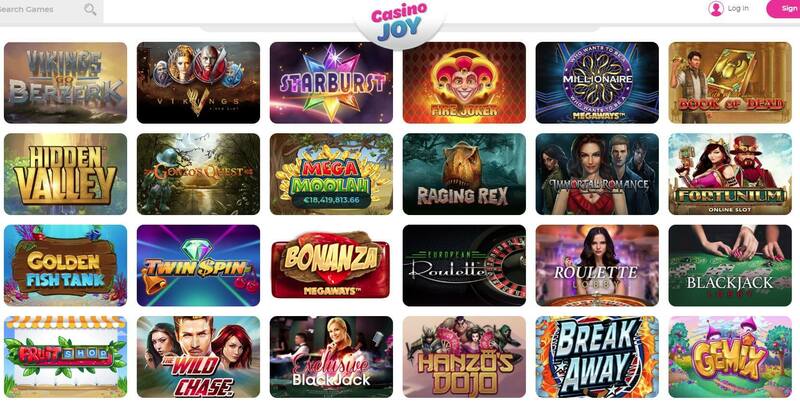 Licensed by the Malta Gaming Authority and the UK Gambling Commission, Casino Joy is a new online casino launched in 2018. With over 1000 top-quality games from the best providers in the industry, Casino Joy promises nothing but the best experience for its customers. Thanks to SSL protection technology, the casino works hard to protect players while they enjoy spinning the reels of modern titles. With an impressive game library and a refreshing bright theme, Casino Joy is one of the best new casinos on the market. The casino is owned and operated by Genesis Global Limited Casinos, a brand that also owns popular online casinos such as Genesis Casino, Vegas Hero, and SpinIt Casino. With a theme that personifies joy, your casino journey at Casino Joy will certainly be pleasant. You can play the games online instantly – there’s no need to download cumbersome software and install it. With a fully mobile optimized website, Casino Joy is a real pleasure to navigate on smartphones and tablets. Everything works quite well and we experienced no hiccups during our testing. The game collection at Casino Joy is nothing short of impressive. There are well over 1000 games, including slots, table games, and live dealer games as well. All the games are provided by industry giants such as Microgaming, NextGen, Play’n Go, Yggdrasil Gaming, and Evolution Gaming. We were very impressed by the live casino that features more than a few variants of roulette, blackjack, and poker, and special live dealer games such as Dream Catcher. In terms of deposits and withdrawals, the casino accepts a variety of payment methods. Apart from the standard debit and credit cards, Casino joy accepts a variety of popular e-wallets. The long list includes iDebit, Instadebit, Paysafe Card, Boku, Skrill, and Neteller among others. Read the rest of our Casino Joy Review for more in detail information. New players who wish to join Casino Jot can claim 200 free spins and up to £200 in bonus money. The bonus must be selected when making your first deposit as the cashier screen. To be eligible to claim the New Player Welcome Bonus, players must deposit a minimum of £10. The minimum turnover to receive the Free Spins on your first deposit for your New Player Welcome Bonus is £5. The Welcome Bonus Free Spins will be awarded to you at a rate of 20 free spins per day, for 10 consecutive days at 12pm (GMT) each day. As mentioned the Free Spins will be credited on Starburst slot game by NetEnt. Please bare in mind that the maximum withdrawal from winnings on the Free Spins is £100. Casino Joy keep their players active with a week day and weekend freebie and prize promotions, so check out the promotions page for those! If a casino’s loyalty program is what you’re mainly looking for Casino Joy do have one. There isn’t much information on how to join but the benefits available to VIP players is quite good. Mobile available is as standard these days so expect a fully working site with over 500 games available to play. There is no app just access the site via your mobile device. With over 1300 game on offer players won’t be bored. As you’d expect Casino Joy cover all the bases with their game selection. When it comes to slot expect to find what you need, with jackpot video and classic slots all available to play. All the big gaming brands are available here ranging from NetEnt to Microgaming. Titles available include Starburst, Mega Moolah, Bonanza and many many more! If casino games are more your thing then Casino Joy doesn’t disappoint. Both standard and live casino games are on offer here. Everything from roulette, blackjack and poker are available as well as Keno and baccarat. There are 3 options when it comes to contacting Casino Joy. They can be reached by with email phone or live chat. To find this information simply click on the question mark icon on the top right-hand side. Live chat is always by far the quickest and easiest way to get in touch. Like all Genesis casino sites, Casino Joy comes with a huge range of both deposit and withdrawals options for players to use. With regards to deposits at Casino Joy options include, debit and credit card, Boku, Paysafe card, NETELLER, Skrill, EcoPayz, Trusty and Entropay. The minimum amount deposit amount for all these options are £10. The maximum varies between £30 and £5,000. Withdrawing money can be done using the same deposit methods (apart from Paysafecard). Card withdrawals take between 1 and 3 days to complete where as e-wallet options are instant. The minimum withdrawal amount is £10 with the maximum £1,900 per withdrawal. We rate Casino Joy a strong 7.2. We liked what this casino has to offer, it has everything you would want and need from an online casino, but we didn’t really get that WOW factor. You won’t go wrong with this casino that’s for sure!